Welcome to Book Review Monday! 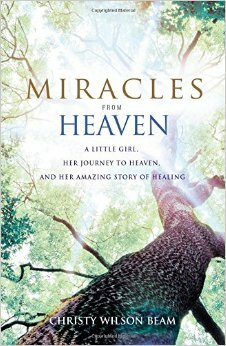 Miracles from Heaven – A little girl, her journey to heaven, and her amazing story of healing – By Christy Wilson Beam Book Giveaway. Yep, it’s time again for Book review Monday and another giveaway as promised! What is book review Monday all about? I love to read! If you know me, you already know this to be true. If you don’t, well, one of my favorite things to do is read. I love it, but don’t always feel like I have the time to do so. Being a pastor, an author, and a speaker, one of the questions I always get from people is, “What are you reading?” I suppose it’s because they want to know what I would recommend, what inspires me, or what I’m feeding on. So, upon receiving an opportunity to giveaway some books, it got me thinking about my love for reading, but I never feel like I can make the time. Then it hit me – I came up with a brilliant idea – Book Review Monday!! Or at least I think it is brilliant. Plus it gives me a reason to read more! I was very excited when Icon Media gave me an opportunity to giveaway another book. This time the book is Miracles from Heaven by Christy Wilson Beam. I haven’t read the other books out there about kids visiting heaven, so I was looking forward to reading the story of little Annabel Beam and her well documented medical miracle. In a remarkable true story of faith and blessings, a mother tells of her sickly young daughter, how she survived a dangerous accident, her visit to Heaven and the inexplicable disappearance of the symptoms of her chronic disease. Annabel Beam spent most of her childhood in and out of hospitals with a rare and incurable digestive disorder that prevented her from ever living a normal, healthy life. One sunny day when she was able to go outside and play with her sisters, she fell three stories headfirst inside an old, hollowed-out tree, a fall that may well have caused death or paralysis. Implausibly, she survived without a scratch. While unconscious inside the tree, with rescue workers struggling to get to her, she visited heaven. After being released from the hospital, she defied science and was inexplicably cured of her chronic ailment. MIRACLES FROM HEAVEN will change how we look at the world around us and reinforce our belief in God and the afterlife. This book drew me in right away as Christy began sharing her story and the journey the Beam family has been on since Annabel was diagnosed with her rare incurable digestive disorder. If I had the luxury of time, I would have read it straight through. I kept my attention and kept me coming back to read more. At 209 pages the book is not long and could be easily read in a day (if you have the time). “Could I have waited patiently and waited for my own child to tell me about their experience in their own time?” Or, would I try and coax it out of them. God is so fantastic and creative in everything He does, and healing Annabel was no different. You and I would have chosen for God to heal her right away as people were praying for her, so she didn’t suffer. However, God’s ways are not our ways. None of us would ever in a million years think a child’s healing would come about from a visitation to Heaven after falling 30 feet into a cottonwood tree. God sure likes to keep us on our toes doesn’t He? Annabel also challenged me. She was/is only a child and has undergone many surgeries, and procedures, yet through it all, she was a trooper, not one to complain much about anything, including pain. She kept her childlike faith – and not just because she was child. She had an unshakeable faith in the midst of it all. I often had tears running down my cheeks as I read this book. Tears of joy, sadness, and even celebration with the family for what Jesus had done! Honestly,” he said, “I can’t explain what happened to her physically while she was in that tree – and I’ve given it a lot of thought. I wasn’t there, so all I have to go on is the radiological data and the medical records from before and after. The proof is in the pudding. She wasn’t well before. Now she is. Those are the only facts I have. All I know beyond that is that she believes she went to Heaven. And I believe her when she tells me she believes it. I hope you will take the time to read Miracles from Heaven. As you read the pages of this book, I am sure you too, will be challenged and inspired by the testimony of one family’s journey involving a Miracle from Heaven. Be blessed and enjoy reading Miracles from Heaven. I just LOVE gifts and I love free stuff too. So, as promised, one blessed person will win their very own copy of the book Miracles from Heaven. A HUGE Thank You to Icon Media who has generously offered a FREE copy of the book to one of my readers. All you have to do is leave a comment on this post. Plus I am testing out RaffleCopter so to earn extra chances to win enter use the RaffleCopter questionnaire below. I will announce the winner in two weeks on Monday July 13th so make sure to come back and see if you won. Please share this review with your friends on Facebook and Twitter. You just might change a life! This book is in my wish list at Amazon so it would be great to win it! I love faith building and affirming stories! I love to read books about miracles and about Heaven. Your book review makes me want to read this book. Sallyann, that is wonderful to hear. I enjoyed it very much, thanks for stopping by and leaving a comment. And the Winner is: Patti Krank – chosen via RaffleCopter! Thank you for entering to win your free copy. Please check your email for further instructions. Thank you to everyone else who entered – new book giveaway coming soon.